Jump off the calories with the ultimate cardio workout! Burn up to 20% more calories while absorbing up to 80% of impact! Shoes are provided. Beginners are welcomed! Routines are easy to follow. We will also have shoes for sale on site. 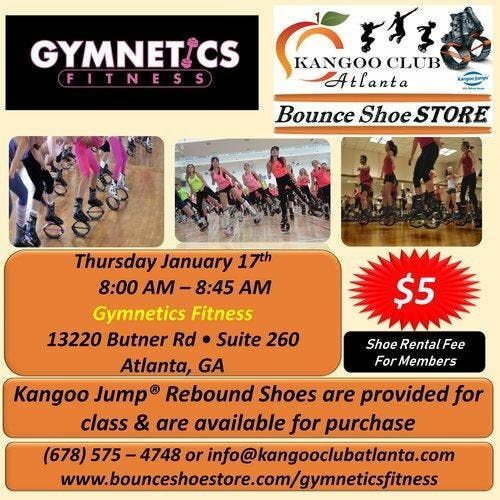 See our entire class schedule here: http://www.bounceshoestore.com/class-scheduleKangoo Jumps Rebound Shoes available for purchase:www.bounceshoestore.comIf you have any questions, email us at aW5mbyB8IGthbmdvb2NsdWJhdGxhbnRhICEgY29t, call 678-575-4748, or inbox us here on FB!